The Walking Stick Memoriam # 05: 1 Spanish Ring Knot, And 2 Turk’s Heads Used To Dress The Ends Of Other Knots. The Walking Stick Post #5, A Spanish Ring knot and 2 Turk's Head knots. The knot on the left in this picture is dressing the end of the 11 Lead X 2 Bight Turk’s Head in Stick post #4. Like most of my knots, it is tied in paracord, this time in black. I don’t remember and can’t puzzle out the Leads and Bights on this Gaucho knot. It must have been somewhere in the 28 thru 32 Bight and maybe 15 thru 17 Lead — either the picture or my eyes are too fuzzy to clarify this any further. Originally this knot was a little better formed than the picture shows, but wear and reworking have tightened it out of shape. 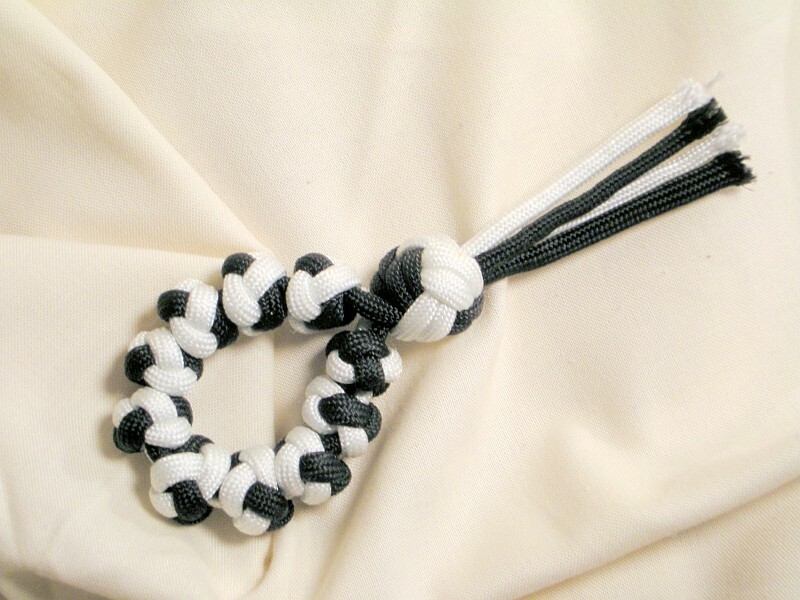 The center knot is done in white utility cord and is a Spanish Ring knot. Just guessing, it was probably based on a 3 Lead X 7 Bight Turk’s Head before the interweave. The ends have started to pull out and fray — this was one of the knots that convinced me that it was time for surgery. 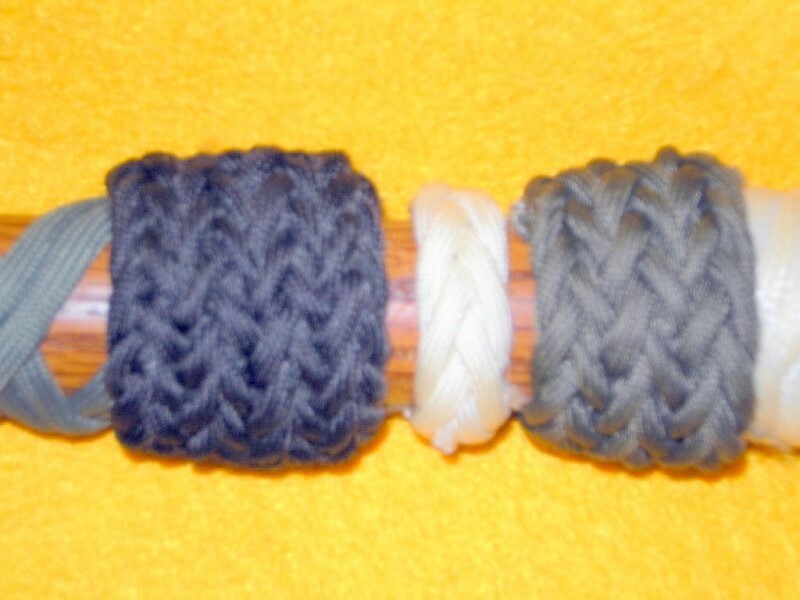 The knot on the right is a Gaucho interweave done in greenish paracord. I am either having a hard day or these pictures are fuzzier than the others in this set. Again, I can’t make out the count on this knot, and my memory is duller than my sight. You can see the wood between the knots. This is because of the aesthetic influence of My Lady Rose. I’m kind of getting used to it now. 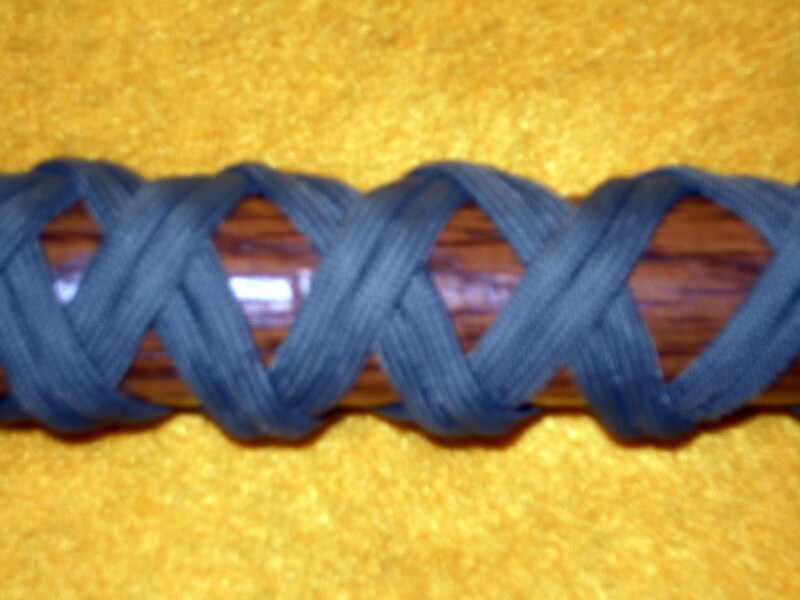 In my early days of learning to knot, painted coachwhipping was used to cover the entire rail. It took the place of other finishes and so had to provide protection from the sea — as well as a firm hand-hold and/or any improvement in looks it provided. Now that I live inland, it isn’t necessary to be so thorough in providing extensive protection — everything but the oil finish is for looks. Thank you for coming by my site. We are now about half way up the stick and still climbing. Come back again; some of the better knots lie ahead. Both my link checking, and some of my readers, have prompted me to interrupt the posts on walking sticks with this public service announcement. The link to the page at the “Semantron” blog for the downloadable PDF file is dead. This is the only tutorial for the “one-handed cat’s cradle” method of tying the knots for an Orthodox Church style prayer rope which I have found. Rather than let this document disappear into the void I am posting a copy for download from my site. Please note that I did not make this tutorial and claim neither authorship nor ownership. I will attempt to contact the author by E-Mail and get his permission to leave this file here for download — or at the very least see if he is going to activate a live link to the file. Download the PDF file of the prayer rope tutorial here. I will confess to being surprised by the interest level in this chain of posts. The coincidence of the knots being of the same structure as the Sailor’s Knife Lanyard knot is a little esoteric for most people, so I must assume there is a high level of interest in making prayer ropes and their kin. A quick Google will reap a collection of links to sites which show how to make knotted rosaries similar to those used by the Roman Catholic Church. Most of them employ some version of the Multiple Overhand knot to make the bead substitutes. Many of these appear to be made for personal use, but many are also made for distribution to the public or to US armed services members, particularly those stationed in forward areas overseas. I have to admit that the Multiple Overhand knots would be quicker and easier — myself, I would prefer to invest the additional effort needed to make them with the Sailor’s Knife Lanyard knots. A very short prayer cord to show the use of the Sailor's Knife Lanyard knot. The short sample in this photo, which was made in paracord, convinced me of that. If this was made out of a smaller diameter cord, with the knots spaced out for easier counting off, it would be a fine specimen. It is structurally sound, clean lined and, to my eye, handsome. You do have to remember that my aesthetic views on knotwork were formed while hanging around boats ranging from commercial fishing craft to classic wooden sailboats. I also grew up with a romantic longing for the sea in the days of the square riggers. Like most romantic views it was unrealistic. One trip around the horn, or even having to do my favorite decorative knots under the eye of a bully bosun’s mate with a ready belaying pin in hand would have cured everything. I finally found what I believe to be the original video tutorial which provided the material for the mash-up that started this trip. You can go to the original site here. I would suggest you read the page under the links to the videos as well, since it has some additional hints. This is undoubtedly the original material — the now extinct mash-up did not improve the lessons. This tutorial is more instructive, even though it is an amateur production, and the larger file size is spent on things that make it easier to follow. I would not be surprised if you had to use the video and its containing page AND the PDF download to make the knots by the one-handed cat’s cradle technique. I find the sailor’s in-hand method much faster and easier, but that may be because it is the way I have tied these knots for years. Thank you for stopping by my site, and a special thanks to those of you who have returned to follow this chain of posts. Come back again; the parade of knots is starting to line up nicely. 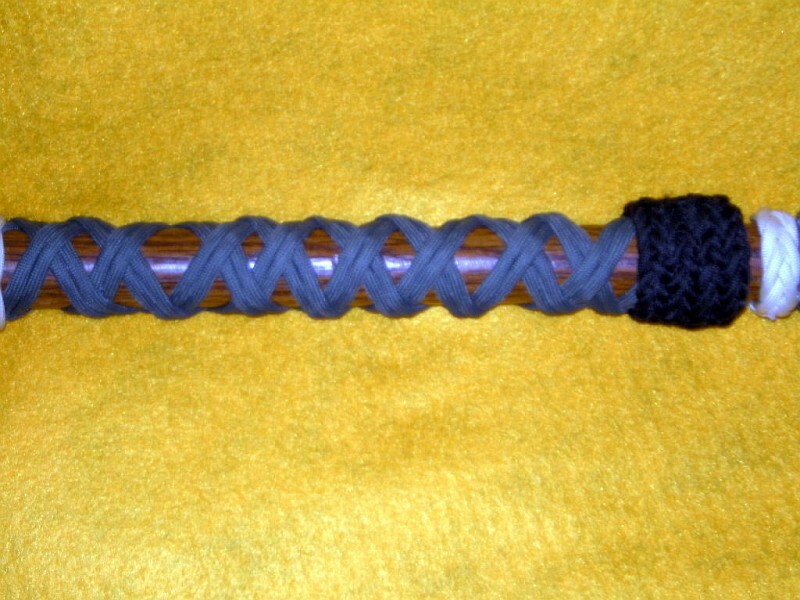 An 11 Part X 2 Bight Turk's Head knot on a walking stick. After my involuntary break in blogging, I am finding it hard to get back up to speed …. bear with me and I’ll try to get the parade back in step. As we move further up the stick, you will notice that the knots are in better shape. This is a matter of wear and tear, rather than order of application. The knots on the bottom of the stick are used for things like pushing brush aside. My Lady Rose likes the look of knots done with an open weave. Before I met her, if left to my own devices, things tended to accrue knots until they looked like they had suffered the fabled sea change – you could not see the original surface for the knots. She has converted me to some degree, although I still tend to use more knots than weave unless it is something I am making for her. This knot is done after the fashion of the “2 Bight Turk’s Head of any length” from Grant’s book; the only change being that it is spread out over a longer distance than a tightly made knot would cover. You do have to use a seizing of some sort to hold it open while you cover the ends with some other knot. The knot on the left/lower end I explained in my last post on the stick (# 3). The black knot on the other end will be covered in my next post. The distance between the two knots that dress the ends was about 14″. Close view of an 11 Part X 2 Bight Turk's Head on a walking stick. If you look at the finish on the wood, the highlights which show are the original finish. When this picture was taken it had about 13 or 14 years of use accrued. For something that was used often, and sometimes roughly, that is remarkable endurance. The finish is of hand-rubbed Tung oil – I learned to do this many years ago when I was hanging around with people who owned classic wooden sailboats. It is still one of my favorite finishes for things made of wood – partially for utility. but largely because I like the look of wood and brass/bronze on those old boats. Thank you for visiting my site, and also an extra thanks for those of you who have stuck through my absence. Come back again; the parade is still in the marshaling yard, but is forming up nicely. The march will start off slow and build up, but it is coming. Status Report From The Parade Marshalling Yard. A short note to let you know how things are going. All of my local links seem to check out. Some of the external links appear to be dead. I am not certain whether this is due to problems on my computer (I haven’t been using it or the Internet for months) … problems on the servers … or problems in the void. Some of the links are to large popular knot sites, and it would be a major surprise and disappointment if they are closed down. I am now moderating the comments from the past months … then on to the E-Mail. I will sneak in a post or two as I go along. I am going slower than I would prefer, because I do not want to overextend myself and suffer another knockdown. Thank you for stopping by … and for your patience. My apologies to all for the long break in mybloging activity. Last February I took two falls… these, together with my ongoing illness, laid melow. I haven’t even been cruising the Net, letalone bloging. I do intend to resume my bloging, but getting it upto full speed will take some time. Bear with me andI will try to make it worth your while. For the requested longer version (possibly moreentertaining but not holding much more basicinformation) click the “More” link. What happens when William decides to tangle with Old Man Winter’s snow and ice? William plays Humpty Dumpty and takes not one, but two, great falls. Concrete is very hard, no matter what’s on top of it, and when William falls, everything notices. That’s why you haven’t heard from him in a few months, but be of good cheer. He has recovered sufficiently to return to the Gods of Knots, but with a couple of interesting twists, necessitated by his injuries. Check in a week from now. A bi-color Pineapple knot is next. This knot dresses the bottom end of a length of 2 Bight Turk’s Head which was done in an open weave. It is also a remeinder of the time when I was just learning to put interweaves on my Turk’s Head knots. Today I probably wouldn’t leave this knot on a walking stick for the world to see. At the time, it was near the top of my knotting skills. I’m sure if I’m still alive in another 15 years, I’ll say the same about the pictures I’m taking today. Of course, it could be much worse — if you practice a skill for 10 or 15 years and you didn’t get better that would be much worse. This is a bi-colored Pineapple knot. If I remeber correctly, and I wouldn’t bet the farm on it, the base knot in white paracord was of 9 Leads X 8 Bights. The intereave was done with the wider visual border created by stopping the weave one crossing short of the standard Pineapple knot. Using Tom Hall’s nomenclature, as near as I can figure it, this would have a 2–2 structure. To the right of this knot you can see the start of the next. My Lady Rose likes the look of a more open weave. Both of these knots exhibit this nature, the next more so than this. "Knottool", or "knot tool", either one. Books on knots & tall ships. Instructables: Tutorials for the world. 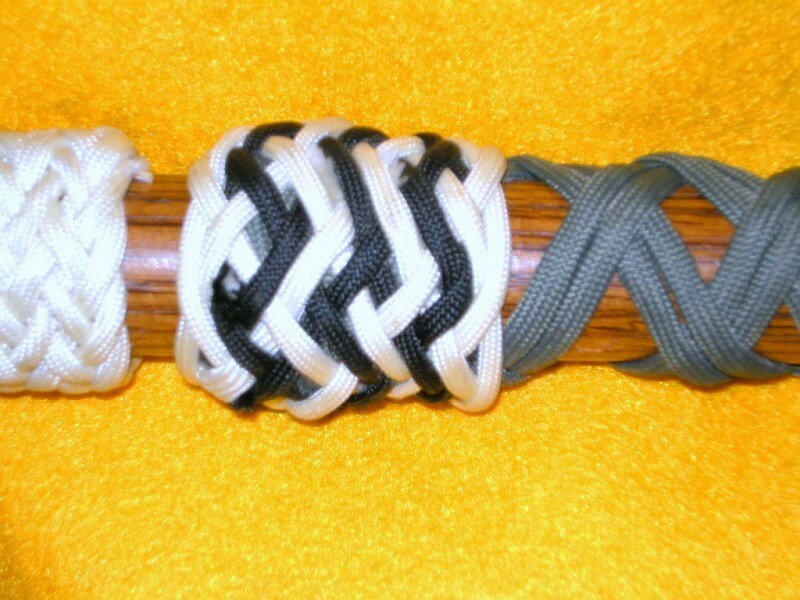 Stormdrane: Paracord and knots, a fine pair.